djkardkreations: Thank You For All Your NBUSSES! Thank You For All Your NBUSSES! I am overwhelmed by your wonderful entries in my NBUS Challenge #7! Thank you, thank you!! More on that below, but first I want to show you the thank you card I made you for your participation! Okay, well, before that, here's some background. Literally. The other day I showed you some "waste art" here in the form of kitchen paper towels that I used at the Happy Little Stampers Retreat. Aren't they cool? You know how I love white space, but I love these, too. The one on the bottom left is my favorite. The problem now is trying to design cards with these fronts that don't cover up all that coolness. I could just trim them and let them fly solo as the front of a card, of course, but Hammy prefers more of a challenge than that so we are going to try and turn each of them into something. To make the above stencil art with my Brushos, I borrowed small Tim stencils from Kathy K at the Retreat. One by each I taped a stencil to watercolor paper cut 4.25" x 5.50". I sprinkled various colors of Brushos over the top of the stencil and then lightly spritzed the whole panel with water. Because the water activates the powder and liquidizes the colors quickly, I immediately placed a section of paper towel over the stencil and, with the help of Ginger Lee, I patted the towel to wick up the water and stop it flowing. That's why the towels themselves are so pretty. The Dotted Die flag is by Avery Elle and the die-cut sediment is by Winnie & Walter. The NBUS on this card is little, but, hey, every little bit counts. It is the schparkly brads that I've had for ages. I believe they might be from Stampin Up. Oh, also, I took my SU Island Indigo marker and ran it around the outside of the Brusho panel to make it stand out a little from the white card base. I made this card before I saw the current Less is More challenge which is peacock colors. Those are certainly peacock colors, but this card is too busy, so I'll just have to make another panel if I get the chance. 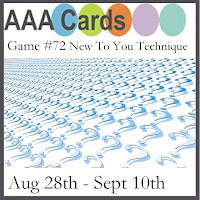 AAA Cards: New-to-you technique. The whole creating art with Brushos technique was new to me before I made these stenciled backgrounds. Pixie's Snippets Playground: Use those snippets! Thank you, my friends, for making NBUS Challenge #7 very successful!! In total, there were 304 entries in the Challenge! WOWZA!! You have shown that you don’t need prizes to be encouraged to dust off that old or new never-before-used-schtuff and give it some love! I appreciate that so much! I also want to thank you for leaving each other some love through your commenting. I thought you might like to know how well you have done with all your NBUSSING since this challenge started on June 6, 2014. In just two years and three months and only seven challenges, you have linked up over 2,380 cards using your NBUS! At an average of 340 cards per 10-day challenge, that’s extremely impressive! You can find inspiration from each NBUS Challenge gallery under the tab located at the top of my blog or you can find it on individual NBUS Challenge Pinboards located at pinterest.com/djkardkreations. This is a hobby with a huge enabling element as new must-have products are constantly being released and new companies open. In addition to enabling each other through our beautiful card art, let’s also keep congratulating each other when we use that NBUS we just had to have! I’m very proud of you and you should be very proud of each other! Keep up the good work! MWAH! Thank you for the thank you Darnell! Your card looks amazing! I love those rich colors. Just an amazing background for our sketch this week! Thanks for joining us at CTS this week! Thank YOU for motivating us to use our NBUS, not only during your challenges, but throughout the year. And your Thank you card is highly appreciated and gorgeous! What a lovely colourful design Darnell and I can't wait to see what you make with the other paper towels. Thanks for another great challenge. Have a good time with your company. So glad to hear that NBUS #7 was a success - as is your wonderful card, that is so dramatic, Darnell. Good to see my mini stencils being put to such great use too, Darnell. Thank you for another NBUS challenge. I'm sure it has motivated us all to carry on using our NBUS. What a fabulous range of creations there were again this time! I think your gorgeous card today really sets off the Brushos beautifully, simple but with a real punch of colour - I love it and also all your Brusho examples! Many congrats on your NBUS success!! Love your arty card Darnell! WOW Darnell . . . your BSST is fab - as is the card. Looks like a lot of fun was had at the workshop and now you've got extra's out of it. Congrats on the number of NBUS entrants. Just goes to show that we fon't actually need all that NBUS we keep on buying and squirrelling away. A few paints and a paper towel is all we need but then we do have to do our bit for the economy and keep all those shops in business!! This is a gorgeous piece of inspuration. Hugs Mrs A. Brilliant card Darnell and a perfect design to show off that wonderful background. Thank you for hosting such a super challenge and for encouraging us to use our NBUS. I love, love, LOVE those backgrounds! Wow! And the finished card is rather fabulous also. I am not even remotely surprised at the number of entries. I reached my maximum, and then just kept on making anyway. I made more cards in this past fortnight that I had in the three months leading up to it! You are the best encourager and we sure took you up on it. I think everyone looks forward to doing this and it sure makes me go back and drag out things. I've had the Hero Arts set forever and never used any part of it. I love all the brusho art you created and now I'm ready to try mine. I have the color burst powders and have tried them without too much success. I've never used the brushos and I'm going to see if they give better results. It couldn't be me! Enjoy your company. Your card is fantastically gorgeous!! I haven't been commenting or blogging for a while. When I got back to it, I just had to participate in your challenge. I managed to post 2 cards yesterday. Thank you for the motivation! Love how your "waste" card came out. Sorry I didn't have time to play in the NBUS, but so glad more than 300 did. Wow. Wow wow wow!! Your Brusho's stenciled papers are wonderful!!! Amazing colourful works! Love them and your gorgous card! Wow, such a great technique. I am adding this to my bucket list of new techniques to try--as soon as I shop for some Brusho. See you are an enabler. I love all the colors. It gives you so many options for accent colors to add. Congrats on your hugely successful NBUS challenges, Darnell! Love your gorgeous backgrounds, too. Looking forward to seeing what you do with them all. A fabulous card - love the colours. Wow!!! Gorgeous! Love those Brusho panels, and yes, I fell to that "need" - lol. Mine are shipping this way this very week, I can't wait! As for your panels, that top left was my fave so your card is truly wonderful!!! AND a BIG THANKS for hosting the NBUS challenge! Incredible response to NBUS' challenge...just shows to go that crafty people don't need outside influence or swag to share their brilliance. Speaking of brilliance, amazing effect this technique of Brusho/Stencilling produces. Your samples, up top, and the card are gorgeous...love that vibrant color. Thought it was funny that my favorite in your first photo was the bottom left, too. Hi Darnell, I love your backgrounds and that card kis fab. Super gorgeous card Darnell!!! I really don't think it is too busy, and like the way you handled the background. Congrats on the NBUS and the numbers you achieved.....yea, we tend to be co horst, by our wanting desires, to buy more than we need.....and I am so guilty! LOL! Hi Darnell, and thanks for the fun challenge. I'm SO IN LOVE with the background on that thanks card. I must try this! I also want to invite you to share your cards at my challenge blog. I'd love to have you play along. This is just beautiful, Darnell. I am TOTALLY a background person and face the same quanderous qaundering abt how to NOT cover all the gorgeousness of a pretty background. Lots of times, just a simple sentiment banner is all that is needed. Love how you dressed up yours a bit with the brads and the diecuts! Thank you, again, for your NBUS challenge!! Always a lot of fun. What a gorgeous card and what fantastic colors too! And, you certainly have lots of great backgrounds for working up more wonderful cards. Gorgeous card Darnell, and thanks again for hosting the latest NBUS gathering. I think you and hammy figured it out quite well. That card is a stunner. Loving it. I was vacationing during most of your nbus challenge and when I returned...my mojo musta jumped out of the car somewhere along the road. I am sure it's hitching its way back to me. Your card is absolutely stunning!! Congratulation for so many entries! You card is fantastic! Goodness, what a beautiful Thank You card you have made for us fans. It looks like you and Hammy have combobulated perfectly and come up with the perfect solution as how to embellish the front of your card without hiding all that gorgeousness. Nice work!! I think your card fronts are fabulous as is, so arty! But I do know what Hammy means by not being quite enough. Silly Hamster, well maybe not as that TY card is one Great card! A gorgeous background and a perfect use of it! Love the dark banner with the bold white sediment! Those sparkly brads are perfect! First, thank you the NBUS challenge. I have been still going through my stamps and using ones that I have not inked up yet. Now I need to use my DIES!! Second, thank you for showing us your beautiful Brusho projects. I LOVE this technique. I do not have these but have some of the Ken Oliver pigments and assume they work similarly? I need to try them. I need to get some smaller stencils, though. I think the ones I have are too big. And last but not least, I LOVE your card that you made with the lovely background. It is so rich and just stunning!!! Have a great day!! Thank YOU for encouraging the use of neglected schtuff! Your Brusho backgrounds are gorgeous, as is the card you made with the one. And now I have another technique with the I can try! Wow, over 300 entries! That's awesome! Thanks again for bringing the NBUS challenge to life! Absolutely love your BSST backgrounds and can't wait to see them all turned into fabulous cards! The first one is already amazing! No my sweet friend, THANK YOU for all of the love and encouragement you give to all of us!! You are truly a blessing in my blogging world MWAH!! By the way AWESOME card today!! awesome Darnell brilliant card and huge congrats on encouraging us all to use our NBUS!!!!! All your panels looks totally fabulous Darnell. Thanks for linking up this beautiful card at AAA Cards. I am serious in trying to make my NBUS-box totally empty! This time next year it has to be gone to max 10 NBUS-pieces! So I have to make a lot and "have" to play a lot :)! Well isn't this card coooool. There is nothing like playing with background paper and having fun with stencil. I love it. Hey pal...it is us who should be thanking you for hosting this FUNTABULOUS event (channelling my inner Darnell ). Awesome card fronts! 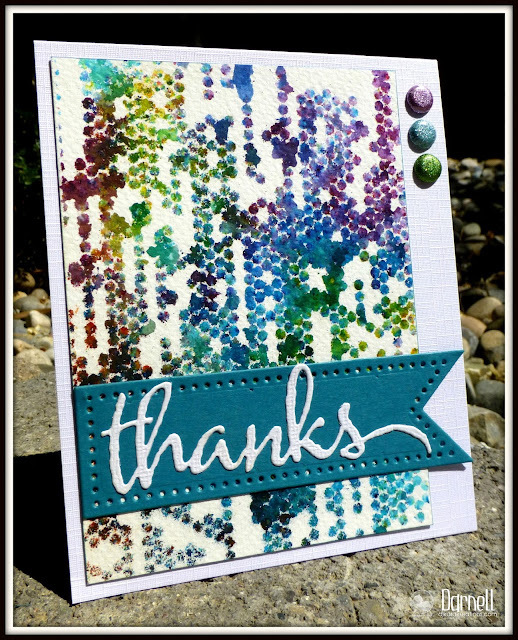 Love the deep rich colors that you used for your card. Looking forward to seeing what you create with the others...especially with the rainbow colored one on the bottom left. Wow on that background.. I love it and the whole table full of future backgrounds.. thanks for sharing all the tips and your cards. Thank you, Darnell, for sharing this awesome technique with us! It's really cool and this card looks very fresh and stylish! Oh how beautiful is your brusho card, Darnell! I just love the colors in this one. The limited additional elements needed when using this very kewl technique is a bonus! 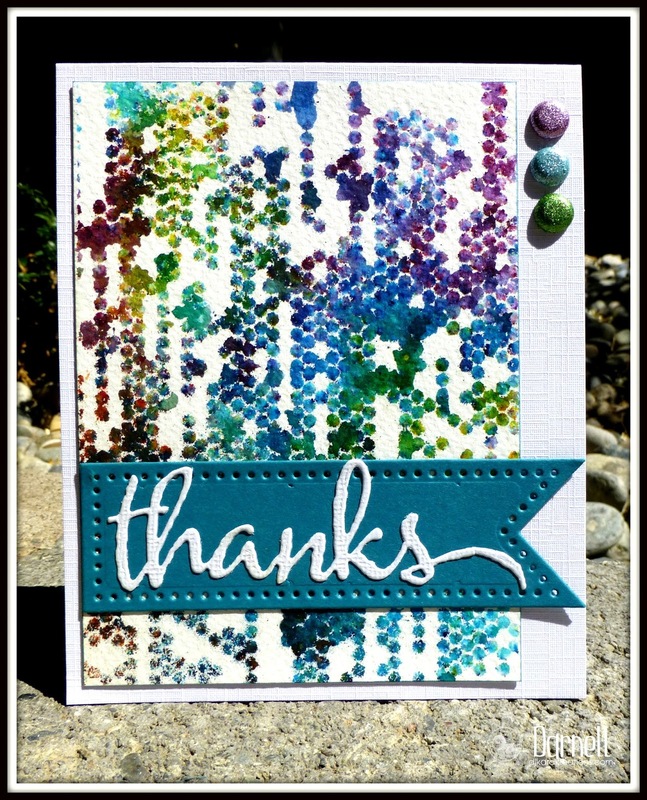 What a gorgeous card Darnell, I love the wonderful background that you've created using brushos, far to good to cover. I really enjoyed taking part in my first NBUS and am looking forward to the next. Oh, this is fabulous, Darnell! I love it! Wonderful take on the sketch! Love the deep bold colours you've used. Such a great card. Thanks for playing along with us at AAA Cards! These backgrounds look awesome! I definitely need to get more colors of brushos... They won't be NBUS for long. I've been ignoring these Brushos hoping everyone would stop using them in such gorgeous ways, but I can see it is a lost cause. These panels are stunning! The one on the bottom left is my favorite, too! Gorgeous card, Darnell! I love to make bgs but then, like you, when I finish I am thinking, so now what do I do with it??? I can't just leave it like this! You came up with an awesome plan!! I'm afraid of those Brushos because I think they are kissing cousins to watercolors and me and watercolors are barely on speaking terms. But you harbor no such fears and have created some gorgeous backgrounds that you can use when inspiration strikes! 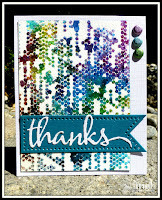 I love the jewel-tone colors and that you dressed them up with a flag die and one of my favorite sentiment die cuts! Wow those are some impressive statistics friend!! It is ALWAYS fun to play along with your challenges and you are correct!!!!!! no prizes needed - YOU my friend, are our biggest reward. Your card is gorgeous Darnell and the Brusho stencil collection is beautiful. My favourite is the bottom right hand one. Amazing background. The pattern and colours are superb. You'll be Brusho bonkers now getting these wonderful effects. Loving the Brusho stencil art...very cool! I love the results of your Brusho stencil art, Darnell. Brushos are something I've wanted to try but too many other products keep getting in the way.